CEV thermal protection testing in the NASA Ames Arcjet facitity. CEV will use the same type of heat shield material as was used on the Stardust Sample Return Capsule. Reentry = process of re-entering the atmosphere of an artificial satellite or crew vehicle. Hypervelocity = velocity above escape speed of Earth (11.0 km/s at 135 km altitude). Speed in Low Earth Orbit = around 17,000 miles per hour (7.6 km/s) - too fast to move through dense air and survive. Purpose of reentry = enter atmosphere at shallow angle so that energy of speed is converted to energy of heat in a controlled manner (skin does not get too hot). Ways to keep skin cool = allow material to evaporate (called: ablation) to carry away heat; or move heat to inside thermal reservoir. 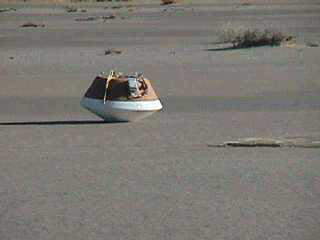 Stardust capsule on the ground after completing a successful drop test. More information on the Stardust website. The heat shield of Genesis is made of reinforced Carbon-Carbon, better known from as the material that makes the Shuttle's wing edge. It is an expensive and difficult to install heat protection. However, it can withstand temperatures up to 2,960 F.
The carbon-carbon material is made by depositing carbon atoms in a manner that they form fibers to fill a space the shape of the heat shield. Voids are then impregnated with carbon matrix by forcing a hydrocarbon bearing liquid, a resin or pitch, into the fiber structure under vacuum. The structure is then heated to boil of nearly all of the non-carbon materials. When well fabricated, this makes a material with one of the highest specific strength of any known material that will keep that strength up to 2500 deg. C. The carbon is prone to oxidation and will burn above 500 deg. C. A coating is used to protect the heat shield from oxidation. 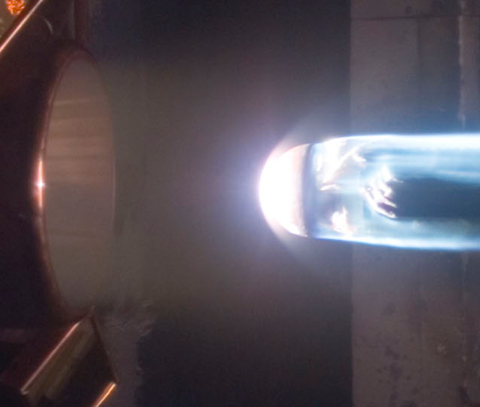 During hypersonic entry, a hot shock layer forms several centimeters ahead of the object. This shock layer, in turn, heats the object; for a space vehicle, a thermal protection system (TPS, or "heatshield") is necessary to protect the payload and vehicle structure. At the entry velocities typified by these spacecraft, the shock layer may reach several thousand Kelvin, initiating complex real-gas chemical phenomena. The energy flux ("heating") to the vehicle surface is a time dependent function of velocity and atmospheric density. Prior to peak heating (high velocity, low density), optical emission from excited atomic and molecular species (N, N2, N2+, O) should dominate the vehicle radiation profile. At peak heating (high velocity, moderate density) the graybody radiation from the ablating TPS surface should dominate the emission spectrum. After peak heating (low velocity, high density) internal conduction and thermal radiation will redistribute heat throughout the TPS, reducing peak temperature and graybody emission. The timing of these events is of intense interest to the TPS design community, because pre-flight estimates of the timing and distribution of thermal energy over the vehicle determine the mass and thickness of the applied TPS. Because very little flight data is available to validate numerical simulations of entry heating and thermal loading, the uncertainties associated with TPS design are large. For conservative design, the applied TPS must be oversized to accommodate these uncertainties. This has a serious implication for mission design. Because TPS generally travels with the payload, TPS mass is traded for payload mass; every gram launched as TPS reduces available payload mass by one gram, so reducing uncertainties in thermal simulation has a direct payoff in payload mass. The proposed observations provide a valuable opportunity to directly measure the relative contributions and timing of radiative and convective TPS heating. The results would provide a sensitive test and validation of the numerical models used for TPS design. Until now, few materials have been tested under actual flight conditions. Much work has been accomplished in the laboratory, notably at the NASA Ames Arcjet facility. However, it is impossible to reproduce both the heat flux to the surface from radiation generated just behind the shock and from convective flow at the same time. Only one successful reentry with an instrumented reentry vehicle at higher than escape speed has been studied in the past. 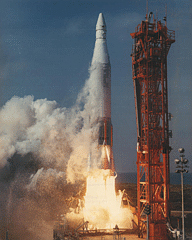 The 22 May 1965 NASA "FIRE 2" experiment (launch shown left) consisted of an instrumented subscale model of the Apollo crew return vehicle, boosted to 11.36 km/s. Telemetric data on heat flux were send to the ground and that data is used even today. No remote obervations were made. The earlier 14 April 1964 NASA "FIRE 1" experiment boosted to 11.25 km/s failed because the booster caught up with the model after separation. The lack of data prompted the Japanese space agency JAXA to launch "DASH" �� Demonstrator of Atmospheric Reentry System with Hyper Velocity" on 4 February 2002, boosting a Hayabusa SRC to 10.0 km/s. The experiment failed because SRC and booster did not disconnect. The properties of thermal protection materials become more important in the future when crew return vehicles will bring passengers safely back from the Moon and Mars.